It is no secret that I love books and I love to read. I also love to give books as gifts, especially this time of year. Today I thought I would put together a few of my favorite food themed books. These aren’t cookbooks. I will share a list of great cookbook gift ideas soon. Today’s book list contains seven of my favorite regular books that all have some sort of food theme. This is one of my all time favorite food books for many reasons. Most people know Julia Child as the t.v chef who was part chef and part comedian, but there is so much more to her life. This book takes a look into the life of Julie Child and covers not only her love of food, but her love story as well. Julia Child did not develop a love of cooking until later in life. She proves it is never to late to change your career path and do something you love. Her path into the food world was not an easy one. It was a tough road that took hard work and never giving up. Mixed in with her love of food is her love of her husband. This book is part food part love story mixed in with everyday life. If you love Julie Child and grew up watching her on T.V., this is a good look into her life and what helped make her what she was and why she loved what she did. Those that know me in real life probably think these are strange books for me to love and recommend. You see I don’t like coffee. Like I really dislike it. I don’t like the taste and I don’t like the smell. When I go to Starbucks I get hot chocolate or a vanilla bean frappacino. Yes, I am one of those people. One of those people that doesn’t understand my coffee loving friends. However, I loved these books! 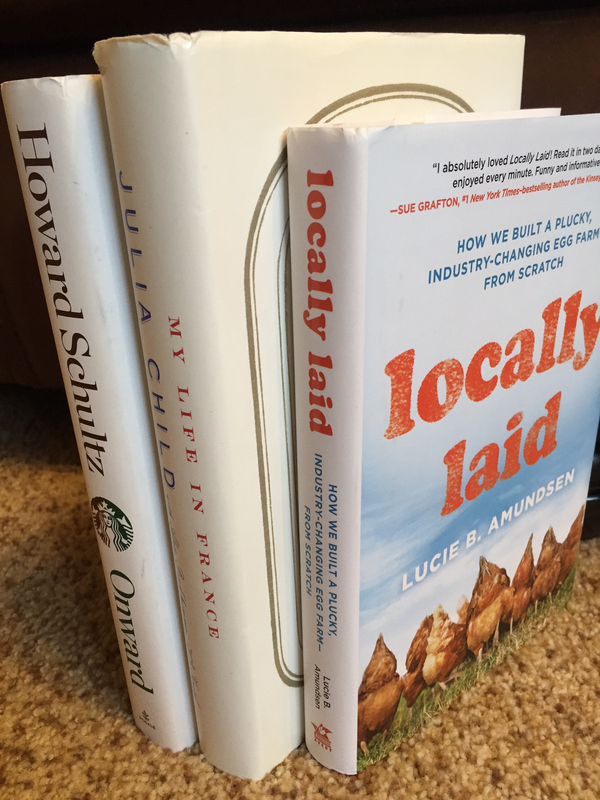 These books are the story of Starbucks. One is the story of building Starbucks from the ground up. The second is rebuilding Starbucks after the brand suffered. Those stories can’t be shared without sharing about the true passion of coffee and coffee lovers. If you love coffee and its history I think you will enjoy these books. If you love business type books I think you will love these books. Starbucks changed how Americans viewed coffee. When I was growing up my parents loved coffee, but it was pretty much the cheapest coffee they could buy from a can at the store. My generation and my kids generation have a totally different view of coffee and that is in large part due to Starbucks. They changed coffee and in many ways the culture of America. These books show the fascinating story of how they did that. This was a recent and fun read. It is a modern day story of egg farmers. I grew up in the country and currently live in the country. I have never farmed as a main job, but having spent my life in the country, I am well aware of the work involved. It is not an easy job as a side job. Making it your life is even harder. This book does not sugar coat farm life. The author and her husband set out to farm a certain way and they share the hard reality that hit them along the way. Farming is not the idealistic life many make it out to be. What I loved about this book though is that the author mixes in humor with reality. If you have ever lived in the country or longed to live in the country, this is a fun read. I will say that there are some politics related to food in this book. It is hard to write a food book in modern times without it. No matter what side you are on you won’t agree with everything in this book because it deals with the real life issues of trying to farm in our modern world. And the reality is that world is far more complicated than most people realize. I read this book several years ago when it was a popular book recommended by bloggers. This book reminds us that food brings us together. Friendships are formed and memories are made over food. Food is the common ground that so often brings us together and this books is a great reminder of that. Many people know about Chic-Fil-A, but few people know the story behind Chic-Fil-A and the work that went into building it. This book is similar to the Starbucks books above and yet at the same time so different. The companies are so very different, with very different visions, and yet many of same things went into building them. They are both stories about hard work and perseverance paying off. And in the end both companies changed how we looked at food. One changed the way we looked at coffee and one changed the way we look at fast food and chicken sandwiches. Who doesn’t love chocolate? This book is a fun and fascinating read about how Milton S. Hershey changed not only chocolate, but how Americans viewed chocolate. Again a similar theme to the Starbucks and Chic-Fil-A books. He changed chocolate in America. He was also an incredible business minded person. This book is part chocolate history, part biography, and part business book. It is also an amazing story of a man that in the end gave almost his entire fortune away to those that needed it more than he did. This is a good read for those that like not only food, but biography and business stories. What good food type books have you read recently?